Misconduct charges are expected against 45 Toronto police officers involved in the G20 summit two years ago, including five senior officers, one of them the commander who gave the notorious order to "kettle" protesters. A copy of an investigative report by the provincial watchdog agency, the Office of the Independent Police Review Director, was provided to CBC News by one of the 37 people who filed complaints about their treatment during the kettling incident. 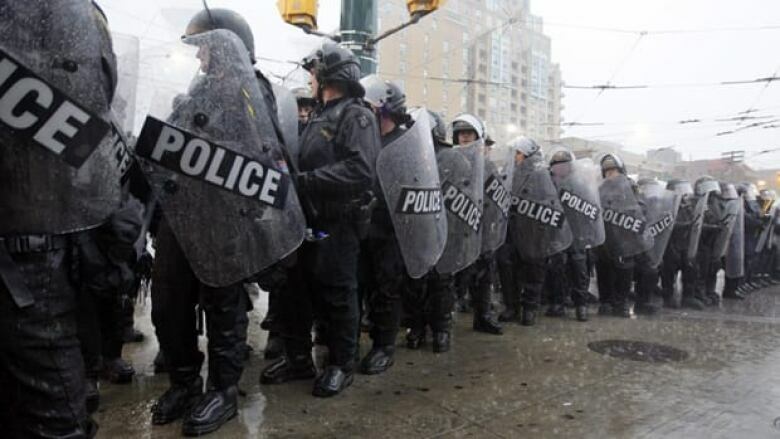 The report says some of the responsibility for detaining several hundred people for four hours in the rain goes all the way to the top, to Toronto police Chief Bill Blair and Deputy Chief Tony Warr, though it falls short of mandating charges against them. But the report says operational responsibility lies with Supt. Mark Fenton, one of two Toronto officers who served as "incident commanders" during the G20 and had control of officers in streets. He is expected to face two charges: discreditable conduct and unlawful use of authority. 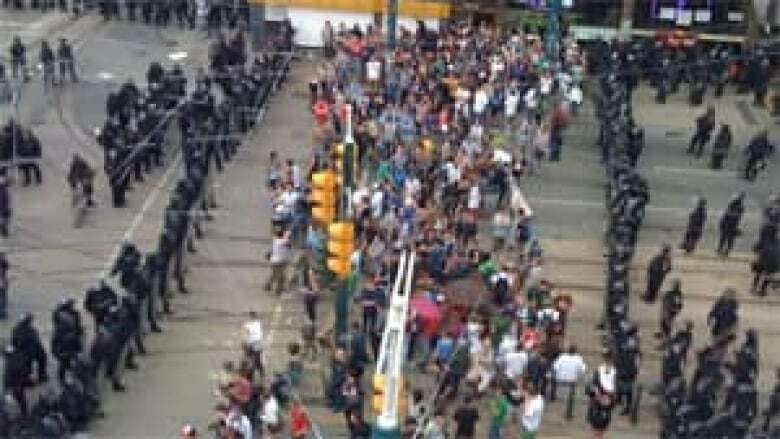 Fenton's order to keep the group of protesters, bystanders and even some journalists boxed in at Queen Street West and Spadina Avenue "in a severe rain storm that included thunder and lightning was unreasonable, unnecessary and unlawful," according to the document. It violated the detainees' constitutional right against arbitrary detention and was negligent, the 276-page report says. The commander's explanation to investigators for his decision was that he feared police riot squads weren't mobile enough to react to "ongoing attacks" by what he saw as "terrorists" committing acts of vandalism in Toronto's streets. "Therefore, the tactic of isolating, containing the movement of the terrorists/protesters was required to stop the ongoing attacks and prevent new attacks," the report quotes Fenton saying. The report indicates the OIPRD is directing Blair to charge Fenton with two counts of misconduct under the Police Services Act: unlawful exercise of authority and discreditable conduct. The charges under the Police Services Act are not criminal and amount to internal discipline, which can result in docking of pay to outright dismissal. None of the out-of-town police officers brought in to help the Toronto force was charged. The watchdog agency investigated nine other officers' conduct in relation to the June 27, 2010, kettling incident, but charges were not substantiated against any of them. Citing privacy reasons, the OIPRD would not discuss its investigation or the resulting report. The OIPRD tabled a separate public report on the G20 on Wednesday that concluded that a "turning point" during the summit weekend came late Saturday, June 26, when Warr implored Fenton to "take back the streets." OIPRD director Gerry McNeilly says that following those instructions, the structure of the Major Incident Command Centre (MICC) broke down. Fenton, the centre's night commander, launched an "autocratic" and "dysfunctional" crackdown ordering mass arrests of protesters. Some front-line officers, according to McNeilly, ultimately disregarded Fenton’s orders at the kettling and let some people out of the ring of riot squad officers, including those with medical emergencies. He noted records of one officer stating of Fenton, "He’s maniacal this MICC, he's maniacal." Fenton could not be reached for comment and did not respond to emails from CBC News on Thursday night. He has not had an opportunity to respond to the report or the expected disciplinary charges against him. Three or four of Fenton's fellow senior officers, and about 40 other Toronto police, are also expected to face charges by the time the oversight body wraps up its investigation of G20 policing. 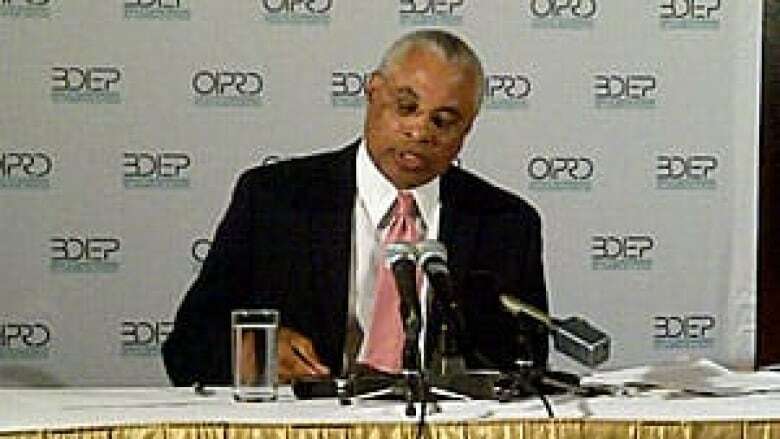 CBC News has learned that to date the OIPRD has ordered Blair to charge 28 of those officers, but the agency is expected to direct him to lay more counts against another 17, including Fenton, bringing the total number of officers facing discipline hearings to 45. The Toronto Star reported early Friday that two of those senior officers found to have committed misconduct are the pair who were in command of the mass detention centre on Eastern Avenue, where hundreds of arrested people were held during the G20 weekend. Some details of the OIPRD proceedings surfaced this week at Ontario’s Divisional Court when Toronto’s police union attempted to have the cases dismissed due to delays. A panel of three judges rejected the application brought by the union on behalf of eight officers — two accused of using unnecessary force on prisoners and six accused of conducting illegal arrests. They are now expected to appear before tribunals on June 19 and July 24. The news of the disciplinary charges comes on the heels of the release on Wednesday of the OIPRD's scathing systemic review of overall policing of the G20 summit, during which the agency says some officers used "excessive force" to crack down on demonstrations as more than 1,100 people were rounded up in the streets. When he released his review, McNeilly told reporters that his team of investigators was also probing allegations against specific officers. He said 350 individuals filed complaints relating to G20 policing, and his office substantiated 107 of them, determining 97 were "serious." An OIPRD spokesman later explained that some of the complaints involved the same incidents and the same officers. The OIPRD proceedings against individual officers add to numerous disciplinary charges already laid by Blair on his own initiative against officers caught removing their name tags during G20 demonstrations. In addition, criminal charges were laid against two Toronto constables by Ontario's Special Investigations Unit, which probes serious injuries or deaths involving police. The SIU charged Const. Babak Andalib-Goortani with assault with a weapon in connection with an incident at Queen's Park in which protester Adam Nobody suffered a broken cheekbone in a violent takedown captured on video. He faces a second count of assault with a weapon stemming from another incident at the same protest in which a woman was hit with a baton. And Const. Glenn Weddell stands accused of assault causing bodily harm after 30-year-old Dorian Barton's arm was broken while he was photographing police during a protest. If you have received a copy of any further investigative reports from the OIPRD, please contact john.nicol@cbc.ca or dave.seglins@cbc.ca. Do you agree with the police watchdog's G20 report recommendations? In wake of G20, will police tactics change?